The Surround Air XJ-3800 Intelli-Pro quite literally ticks all of the boxes when it comes to air purifiers. And by literally, we mean literally! This machine contains seven kinds of filtration, is loaded with a bunch of clever sensors, is energy efficient, quiet and will comfortably handle a very large room or even a whole apartment (up to 600 sq. ft.). 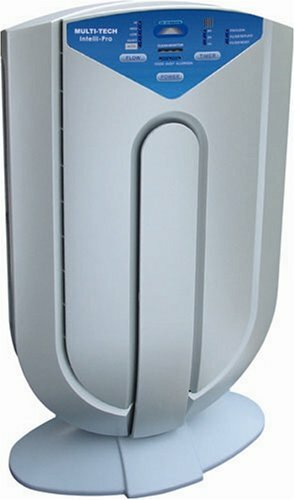 Now on top of all that, the Surround Air XJ-3800 somehow lands in the budget price range for air purifiers. How? We have no idea! It has more bells and whistles than any other air purifier at this price point, is a quality build and covers a massive floor space. You would expect that something with so many functions would have to be skipping on quality somewhere. But their customers can’t seem to say enough about how good the XJ-3800 is. The HEPA filter is very effective on its own at removing 99.97% of airborne particles. This includes pollen, mold spores, dust mites and even smoke particles. The activated carbon filter is for removing odors. The air ionizer generates negative ions (negatively charged molecules) which cling onto the pollutants (positively charged molecules) that are too small for the HEPA filter. The TiO2 filter acts in a similar fashion to the ionizer, and in addition is particularly good at breaking down harmful chemicals (like formaldehyde) into harmless carbon dioxide and water molecules. The UV lamp effectively destroys bacteria and viruses such as E-coli and Rhinovirus. The pre-filter catches all the large particles before they make it through the rest of the process. It is also washable, so this helps to extend the life of the rest of the filters. Finally, the electrostatic dust collector plate. Just like the pre-filter, this plate collects excess particles in order to extend the life of the whole system. Wow, that is a lot of filtration! It might be quite overwhelming if you are new to the world of air purification. It is safe to say that you are well and truly getting bang for your buck with the Surround Air XJ-3800. Speaking of value, how much will this unit set you back? $180 is the latest price on Amazon, and depending on where you live, it looks like free shipping is included. This also includes a 30-day risk-free guarantee, and if you decide to keep it, Surround Air has a 3-year warranty for the XJ-3800.